CBI grid has fared very well in the recent Earthquakes; from Hicks Bay, to Wellington and Christchurch, the suspended ceilings constructed with CBI grid did not fall down. As of the 22nd of November there have been no reports of any damage to CBI suspended ceilings around New Zealand. Furthermore, no ceilings designed by JSK Engineering Services suffered any damage. We stand by our Research and Development in this field. T&R Interior Systems are proud to advocate for safer ceilings and recent events strengthen this resolve. Amendments have been made to the New Zealand Seismic Design Actions Standard (NZS 1170.5) and came into effect in September 2016. These changes significantly influence the design and installation of ALL suspended ceilings. Since NZS 1170.5 is the design actions standard cited by Verification Method 1 to clause B1 of the NZ Building Code, it must be adhered to in order for an installed ceiling to comply. Before the amendment, seismic design requirements for ceilings were the source of confusion, namely around selecting the appropriate part category to apply. This was especially a problem with tile-and-grid suspended ceilings. The previous version of the standard allowed ‘parts’ which weighed less than 10kg and which were less than 3m above floor level to be classified as part category P7, which only required design to a serviceability limit state (SLS) - design for no or minimal damage during a 1-in-25-year earthquake. By considering only the weight of individual components, rather than the total weight of the ceiling system, meant that ceilings were not designed for much larger ultimate limit state (ULS) events. Ultimate Limit State events are a 1-in-1000 year event and for buildings of a higher importance level (IL), the requirement increases to a 1-in-2500 year event. It is obvious that selecting a Serviceability vs Ultimate limit state has a huge effect on the resulting seismic design. The vagueness in the previous standard surrounding weight led some designers to treat all ceilings as P7 parts since individual components weighed less than 10kg. Others considered the total weight of the ceiling system and designed for ultimate limit state events. A third group made a case-by-case assessment for each design, depending on the total weight per square meter of the ceiling components, the height above the floor and the location. Supporting comments provided in the amended version of NZS 1170.5 resolves this confusion. The new standard lowers the weight threshold for ultimate limit state design to 7.5kg, and makes it clear that the total weight of the ceiling system needs to be considered - tiles, grid, luminaires and any other supported services. It is no longer possible to define ceilings as P7 simply because the weight of the individual components is below 7.5kg. Except for exceptionally small ceilings, they all now need to be designed for ultimate limit state events. 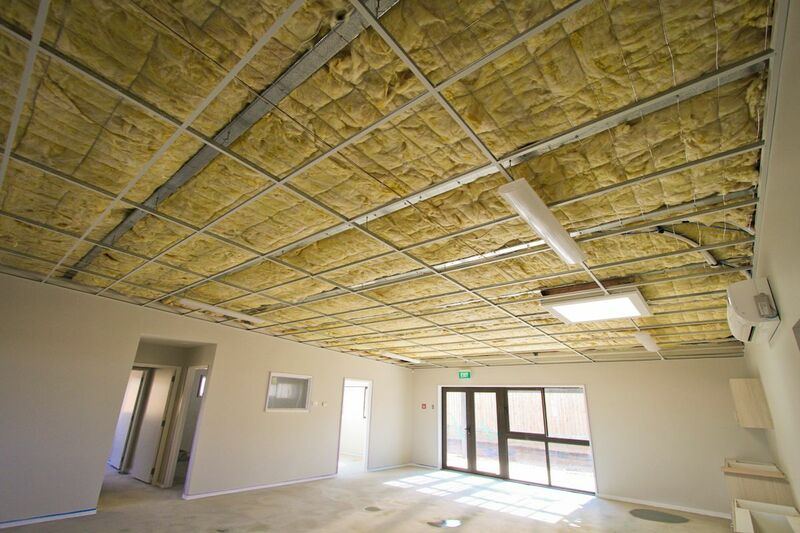 Given the performance of suspended ceilings in the Canterbury earthquakes, and reports that are emerging about the performance in the recent Hanmer Springs quakes (especially in Wellington), these changes are very timely. Collapsing ceilings can injure occupants and interfere with evacuation and reoccupation of a building. The most important requirement is to design all future ceilings for ultimate limit state events. T&R will issue updated seismic design guides and calculators which provide ULS design frameworks in early 2017. Once this guide is available, it will be possible to use them with confidence and comply with the Building Code. In the mean time, for smaller projects, please us the calculator and assume a height OVER 3 meters. This will give approximate compliance with the building code.